Today is a great day to thank a veteran and count our blessings! I've worked on a number of sewing projects today, but I think crossing the Cut Glass Dish (#26) off my Farmer's Wife Sampler block list feels like my biggest accomplishment. This was my second go at this block. The first time, I tried using Moda crossweave as one of the fabrics in those 1" HSTs above. I couldn't work with the bulk, so I tried again and the second time's a charm. I am pleased with my points, but I was extremely disappointed when I put my block on the wall and stepped back to discover that those stupid dots not being straight makes my triangles look crooked! Ugh! That's what I get from trying to cut my fabric on the straight of grain rather than with the print. It does create some nice movement and goodness knows I'm not redoing it. 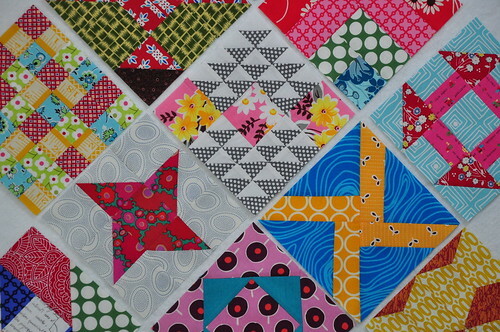 The other two blocks I added are #41 Friendship Star (red star on the left) and #108 Windmill (gold and blue). I love the way these are coming together. It's a really fun project! Are you working on a Farmer's Wife Sampler? 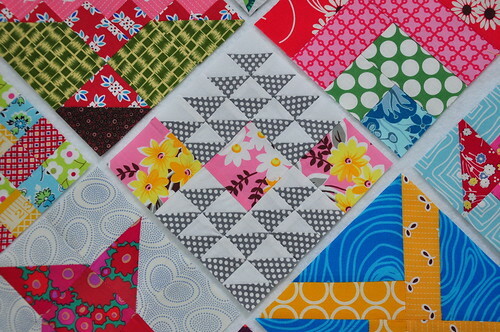 Love all of these blocks! these are all just beautiful! I wish I were working on a Farmer's Wife Sampler. Maybe things will slow down a little and I can go back and do that! I think your blocks are great! 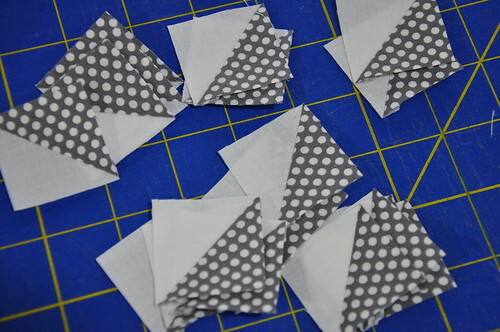 Wish I could do those blocks but I think the pieces are too teeny for me to work with. Love the way your's is looking so far. Melanie, yours look great! I AM working on the Farmer's Wife blocks, but am getting discouraged, I must say. My first six blocks, I thought I was being so efficient, but I cut them down to 6"! I've remade a few but am losing steam! Yes...as a matter of fact I am working on the FWQA! I just joined and posted about it today. I hope you come over for a visit and see! Yes I am - and your blocks look fantastic! Yup I am doing the FWSQ. I am going to do number 5 bat wing and 6 big dipper this week. I love the dots with the FMF--what a great combination!! Yay. Aren't you glad THAT block is out of the way?! The movement is like a little dance. I love it. I've started the Farmer's Wife, but am not happy with my fabric choices....I will likely start over and seeing your lovely blocks is pure motivation! Your blocks are looking mighty nice! I love how they look. That postage stamp is adorable.